Have you seen these sites? They're the new "cool thing"! Each site offers a different deal of the day. They are only there ONE day, and they tend to sell out quickly (sometimes in minutes). If you love stalking for diapers, watch out, this can get addicting too! So far I've been happy with my [far too many] purchases! You do need to read the fine print, but they are all first quality items, and GREAT deals -- even some cloth diaper items. One of the best ways to keep tabs on the offers is to follow them on Facebook or get daily emails. Have any of you made purchases from these? Do you know of any others? I'd love to hear your stories! Friday Favorite - RsLangArtPottery & Butter keepers! I received an email awhile back regarding butter and margarine...while it turned out to be an inaccurate email forward, it did get me thinking. On my "green" list of things to do is to try to eat more natural foods. I decided for me, a tablespoon of butter every now and again is going to be better for me than something filled with chemicals. But I HATE trying to spread cold butter!!! My mother-in-law introduced me to the concept of butter bells - a way to keep fresh butter room temperature, without spoiling. After searching the commercial brands, I wondered if anyone made them on Etsy. Lo and behold, I found some! 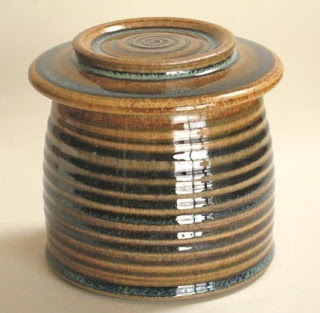 The one I settled on was from RS Lang Art Pottery - it holds much more than most of the others I found, and I liked the styles and colors. This is the one I got - it matches our granite counter tops very well! I am VERY happy with my purchase! It fits well in my hands, keeps the butter soft and fresh, SUPER fast shipping, and great communication.